Adam Antolin (L) vs Joby Sanchez (R) at GKO 10 in Jackson, California. 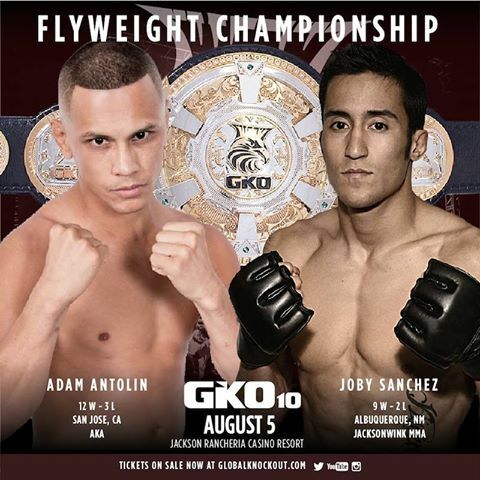 A solid flyweight title fight has been scheduled for Global Knockout’s August 5 event between former UFC fighter Joby Sanchez and former UFC TUF 24 contestant Adam Antolin. The bout will headline the GKO 10 card set to take at the Jackson Rancheria Casino Resort in Jackson, California. Adam Antolin (L) vs Joby Sanchez (R) at GKO 10 Aug. 5 in Jackson, California. The 25-year-old Sanchez (9-2) is coming off a unanimous decision victory this past February against Jesus Urbina at Jackson-Wink Fight Night 1 in Albuquerque. Antolin (35) comes in riding a career best 8-fight win streak where along the way he participated in The Ultimate Fighter television series where he defeated Sanchez’s teammate Damacio Page. The bout pins products from what are considered two of the best mixed martial arts gyms in world; Sanchez from Jackson-Wink MMA Academy in Albuquerque, New Mexico home to premiere fighters such as UFC fighters Jon Jones, Carlos Condit, and Holly Holm. Antolin hails from American Kickboxing Academy in San Jose, California whose equally impressive stable of fighters includes current UFC Light Heavyweight Champion Daniel Cormier, Khabib Nurmagomedov, and former UFC champions Luke Rockhold and Cain Velasquez. SWFight.com will provide continued coverage in the lead up to the bout.